I made this large size super cuddly owl pillow using quality designer cottons in hot pink chevron and dots on one side, super soft fuchsia minky (polyester) on the other. Wool blend felts were used for the appliquéd eyes and beak. Measures approximately 15 1/2" tall and 11" wide and filled with a nonallergenic fiber. Can be spot cleaned or machine washed with a mild detergent on a gentle cycle. Due to the handmade nature of this item, please allow for very minor differences from the one pictured. 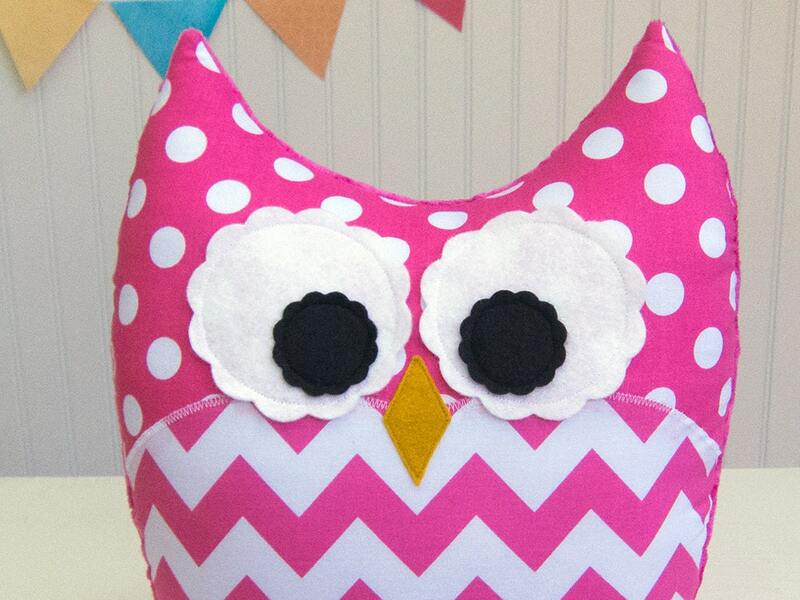 All of the same fabrics will be used to make your owl and it will be just as cute! I purchased this owl to use as a decoration at my daughter's baby shower. She can then use it in the nursery. LittleSidekick was easy to work with and helped me choose a color that would coordinate nicely with the smaller damask owl I also purchased. Great quality, well made, and cute fabrics and patterns!